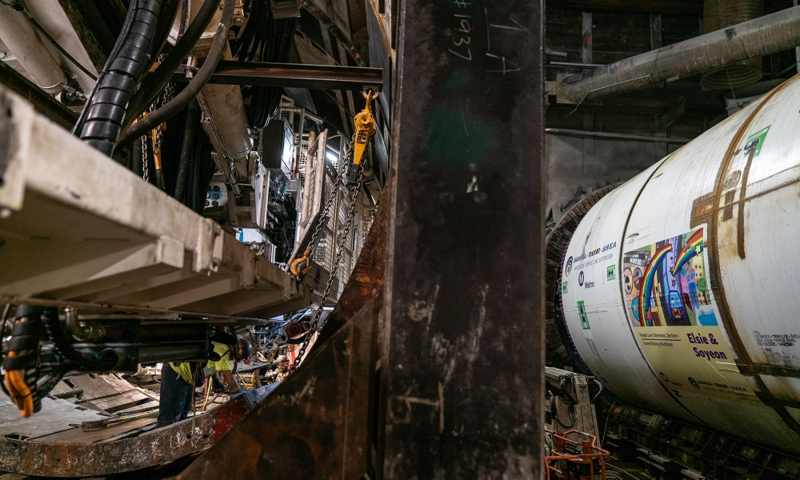 Twin tunnel boring machines (TBMs) from Herrenknecht, named Elsie and Soyeon, will begin by tunneling parallel underground sections between the future Wilshire/La Brea Station and the current Wilshire/Western Purple Line terminus. 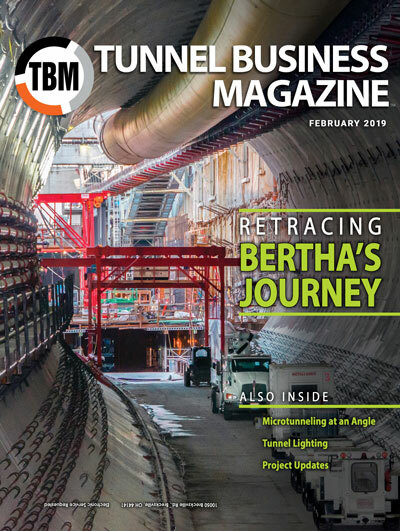 The TBMs each weigh 1,200 tons, are 450 ft long, have a diameter of 21.8 ft and will simultaneously be excavating approximately 60 ft per day in the twin tunnels over the next two years. The TBMs will work in tandem, with Elsie expected to trail her sister by about 150 ft. The two machines will be separated by about 16 ft of soil as their giant cutter heads spin to grind away the soil in their path. Meanwhile, hydraulic arms at the rear of the machines are inserting concrete segments into the newly mined tunnels, which also help propel the machines further forward. 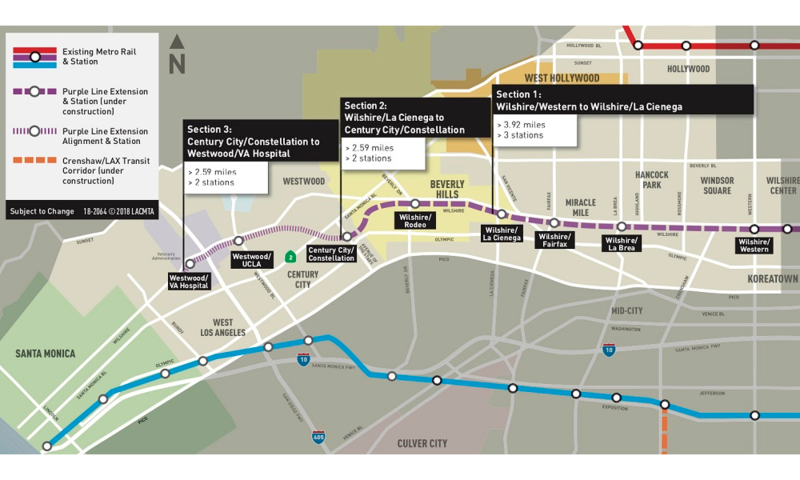 Metro broke ground on the 3.92-mile first section of the project in November 2014 that will begin at the existing Wilshire/Western Station and continue to new stations that are being excavated at Wilshire/La Brea, Wilshire/Fairfax and Wilshire/La Cienega. The $2.82-billion project section is funded by Measure R and federal funds. Stantec will lead management of the construction of this section. The Phase 1 contract was awarded to the Skanska, Traylor Bros. and J.F. 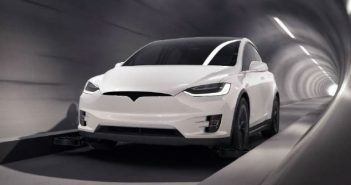 Shea joint venture (STS) for $1.6 billion. The first section of the Purple Line Extension Project is scheduled to be operational in 2023 with the second section to Century City in 2025, and the third and final section to the Westwood/VA Hospital in 2026. When complete, the Purple Line will speed transit riders between downtown L.A. and Westwood in 25 minutes, with other stations at Wilshire/Rodeo in Beverly Hills, Century City/Constellation in Century City and Westwood/UCLA and the Westwood/VA Hospital in Westwood. The subway extension is projected to serve 59,000 riders daily – including 17,000 new riders. “The Purple Line Extension Project is an important part of Metro’s ambitious plan to improve and expand mobility throughout Los Angeles County and will serve our region’s second-largest job center,” said Metro CEO Phillip A. Washington. 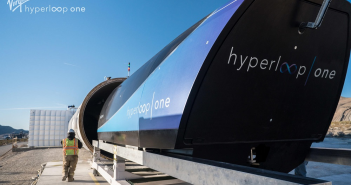 “This is one of the most significant transit projects we plan to deliver to the public before the Summer Olympic and Paralympic games arrive in Los Angeles in 2028.